Welcome! I’m beyond thrilled to share our family room with you today. It’s been a labor of love since the moment we moved in. Taking our time and really choosing things that we love has been so important to us. I am extremely grateful to call this space home and hope you’ll enjoy taking the tour. There are a ton of photos so I will keep the commentary to a minimum. There is a comprehensive source list at the bottom of the post. I’ve always gravitated towards neutrals but am not afraid of a bold dose of color. Hence the blue velvet sofa. Soon after we moved in I stumbled upon that at HomeGoods. I had to have it. To this day it makes me so happy. It not only adds energy to the room, but is by far one of the most comfortable couches on which I’ve sat. The entire family loves it which makes it even better. 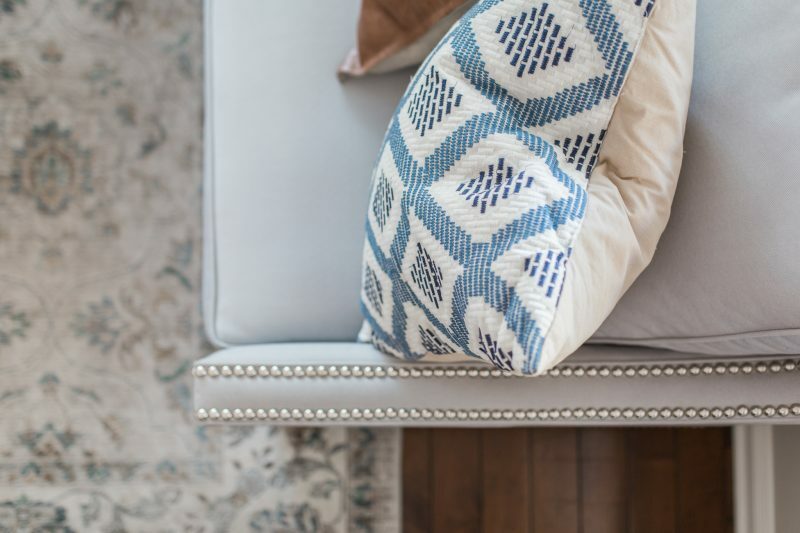 I am all about the details so when we designed this sofa I wanted to add a bit of glam. I just didn’t want it to fall flat in the space. This room is quite large and having this couch made allowed us to better utilize the space we have. The rug was a very fortunate HomeGoods find. These two Ikea wicker chairs help unify the space and add texture. They are surprisingly comfortable. And you can’t beat the price. The built ins were here when we moved in and one of the many reasons we fell in love with this home. They were dark to begin with so we gave them a fresh coat of white lacquer. I’ve kept the built ins very simple. 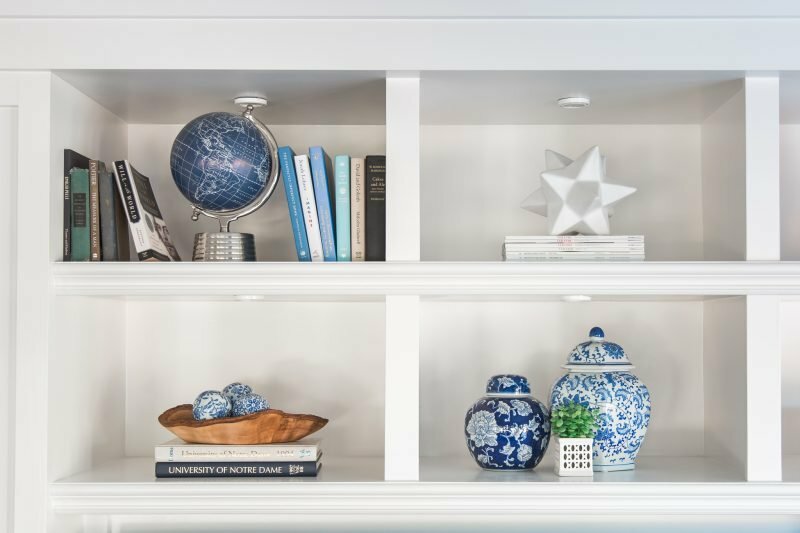 Sticking with blue and white plus a few wood accents keeps it all feeling cohesive. My grandfather was a builder. The brown box contains the surveyor that he would use on each property. His initials are etched in the top of the box. It’s such a special part of this room and a wonderful way to keep his memory alive. It was important to me that I balanced the mid-century modern blue sofa with a very traditional element. This table is a perfect spot to set a cup of coffee and we fill the vase with foraged greens from the yard. Surprisingly, they always last such a long time and add visual height to the corner. The final piece to this puzzle was the coffee table (currently 25% off). When we moved in, we brought the table from our previous home. It worked well while we patiently waited for the right piece to come along. This room is quite large and I knew I wanted the table to be big enough to unite all of the seating. I also wanted it to be a piece that looked aged. Something with character. As soon as I saw this table from McGee & Co. I knew it was perfect. We adore everything about it. I foresee hours of games, puzzles, appetizers, game watches, and more all atop this table. The beautiful box holds our remotes. It’s the perfect size and I like that when we clean up we can tuck those away. Otherwise we just toss them in the basket tray. Also easy but still pulled together. We’ve had this bar cart for years. It’s one of my favorite pieces. Always fun to mix up the styling of it, too. Seeing as though this is our great room, it opens up to the kitchen and breakfast nook. This allows you to see how the space all works together. I saved money by making all of the window treatments myself. 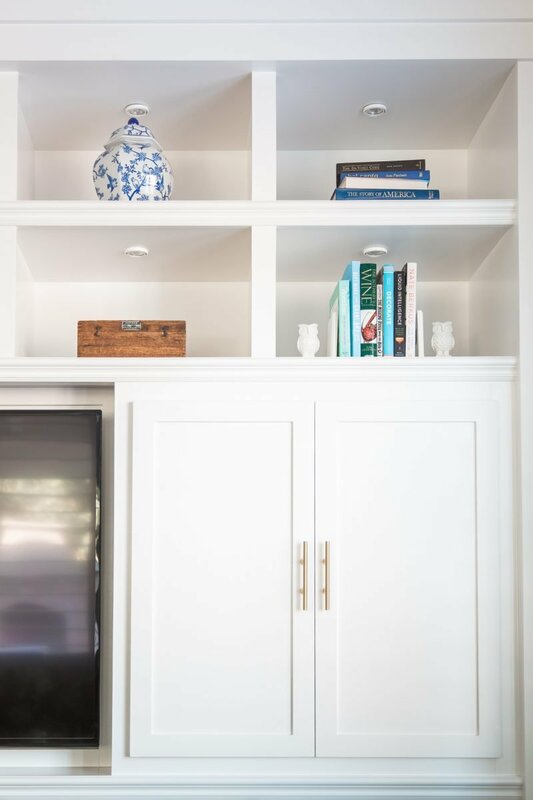 Our walls are Pale Oak (more on that color here). The trim color is unknown. We spend hours gathered together in this space each and every day. Most days you can find me blogging from this couch. The room gets drenched in sunlight and I wouldn’t want to be anywhere else. Thank you so much for letting me share our space with you. Below is a complete source list. Oh that makes me so happy, Marianne. I love that it might give you an idea or two. And you are most welcome. It’s having readers like you that make working on the blog so much fun. Have a wonderful day. Thank you, Caley. 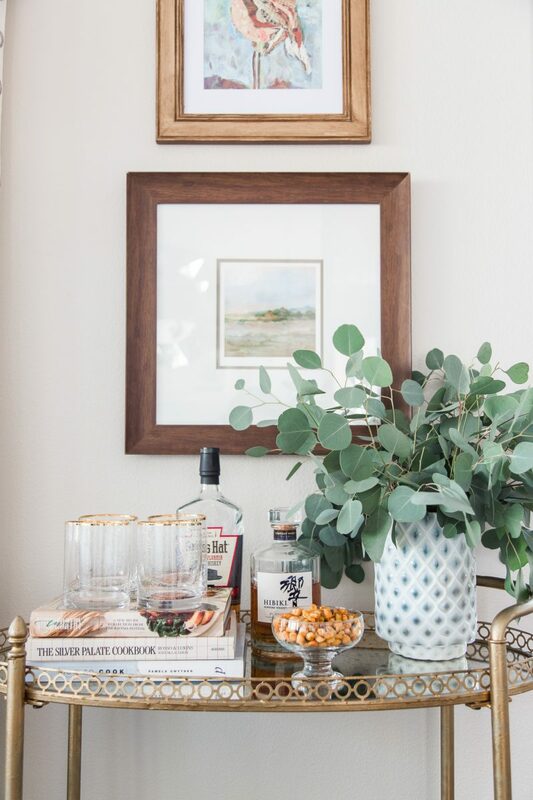 That bar cart has been with us for years and has seen many different spaces. Nice to have it work in this room, too. Have a great day, my friend. So beautiful! 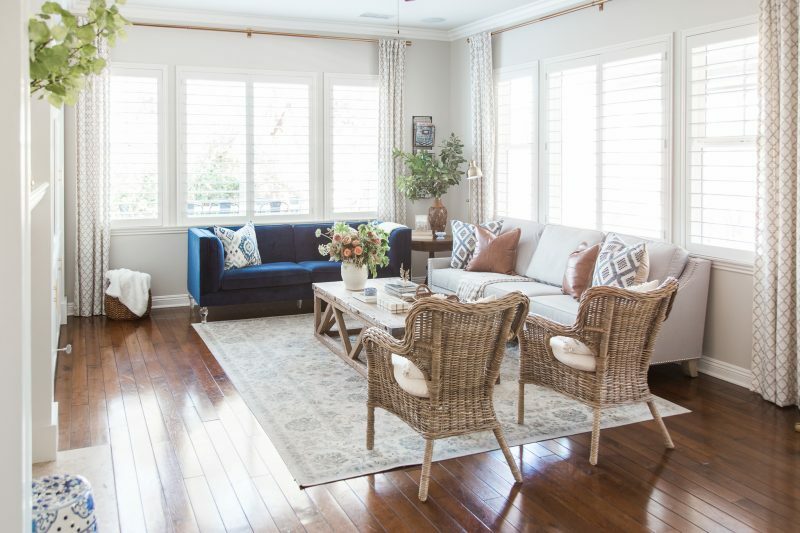 Looks like the perfect room for enjoying time with family and friends. 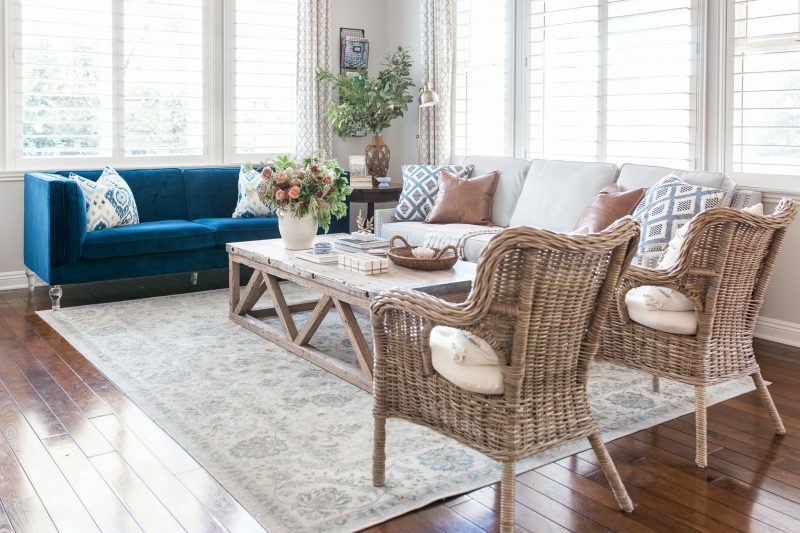 I love all the design choices you’ve made…especially that stunning blue sofa. Gorgeous! Thank you very much! That sofa is my favorite, too. Looking forward to making many memories in this room. Thank you for stopping by. Hi! 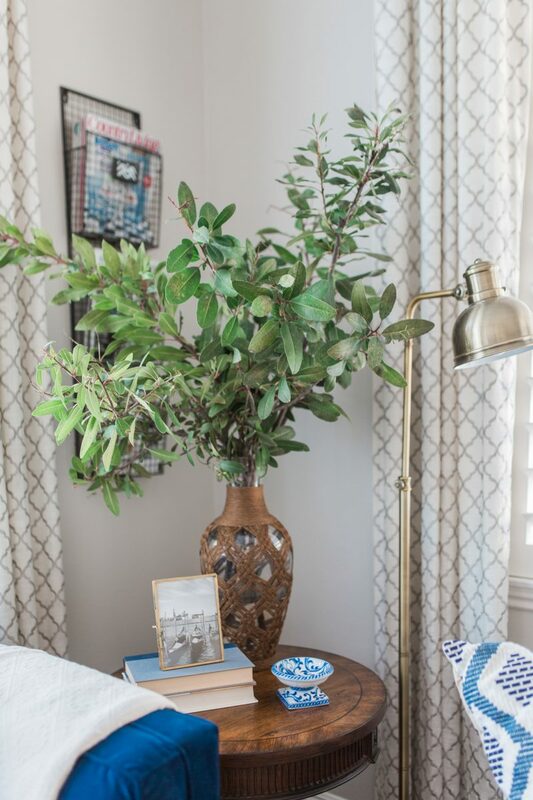 Can you talk about where you got all the greenery around the room? Are they real or faux? Thanks! Yes! 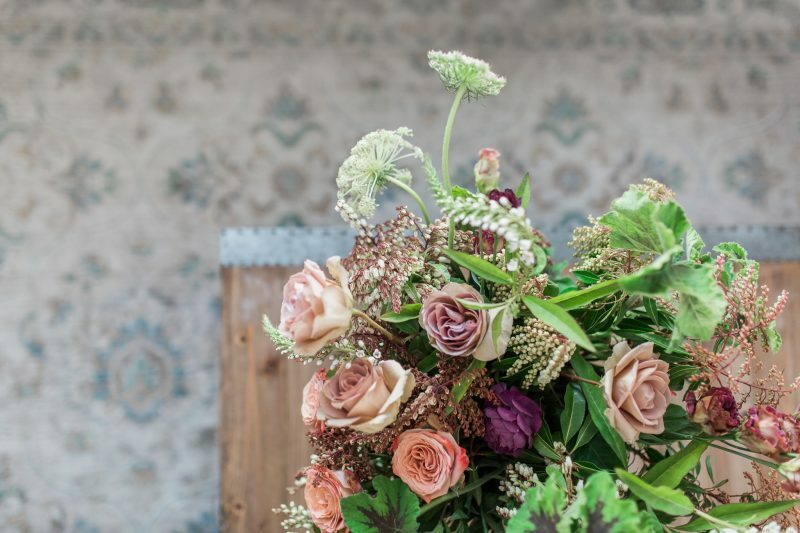 Those gorgeous floral arrangements (coffee table and breakfast table) were made by the darling Marianne from Poseypop ( I linked her Instagram at the bottom of the post). She is talented beyond measure. Many of the greens are from our yard. 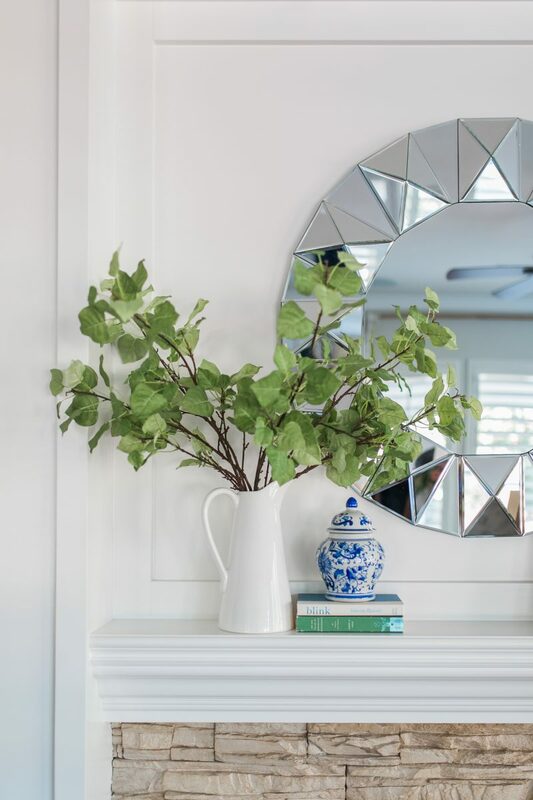 The only faux arrangement is the one on the mantel. Those are from Magnolia Home. Hope that helps. Thank you for stopping in to visit. 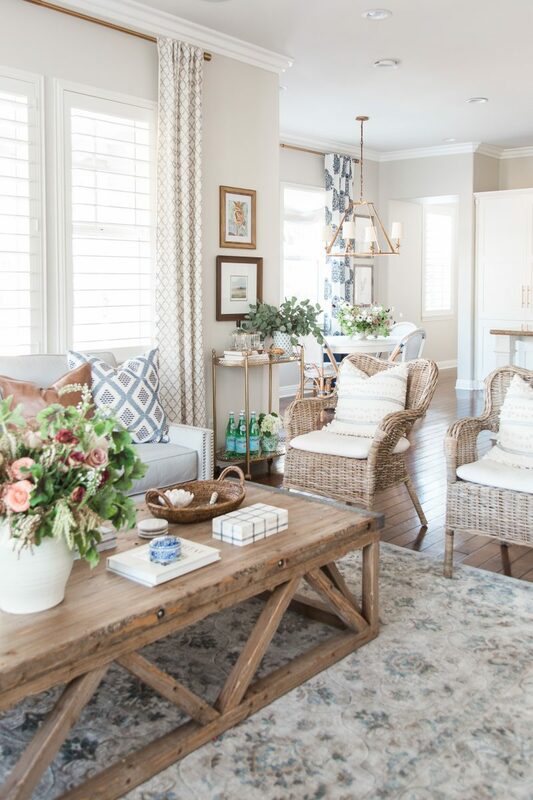 Beautiful room…I love your style! That coffee table was worth the wait. Stunning Courtney. Another room done to perfection. Simple, yet elegant. You can tell each item was well thought out and placed perfectly. And the flower arrangements are gorgeous. Thank you, Lauren!!! You are so sweet. Always so supportive. All the credit goes to Marianne for those beautiful flowers. It was such a treat to see her work her magic in our space. If only she could come every week. 😉 Thank you for the kind words, Lauren. Laura! Thank you so much. I really appreciate your saying that. Thank you for taking a moment to comment. Enjoy your day. 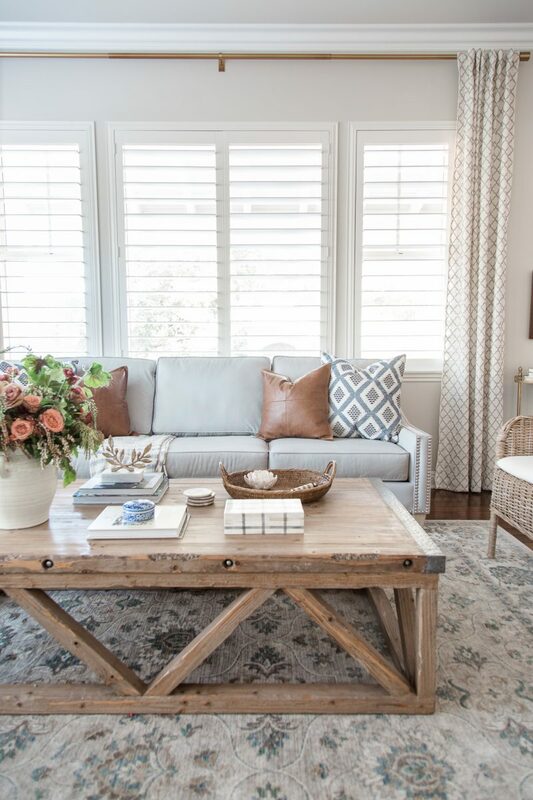 What a gorgeous space you have pulled together! It looks so homey, cozy and inviting. I just want to curl up there! You have such a wonderful style, Courtney. 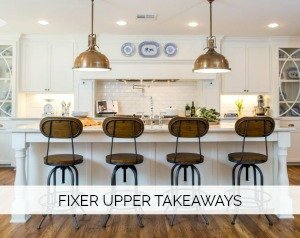 I love all the neutrals but you manage to really bring all your spaces to life. Love it! Such a beautiful space!! I just love your style, Courtney! 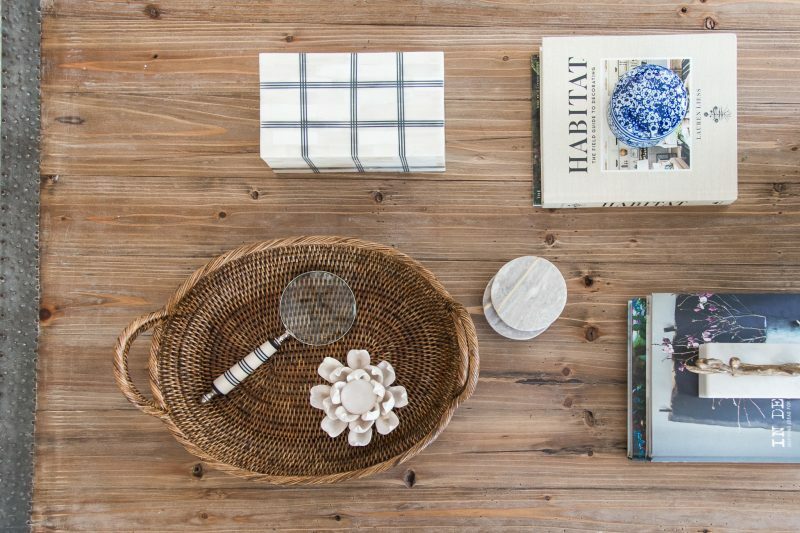 You are truly talented in putting a space together so thoughtfully (see what I did there? ), but that’s the best word to describe your spaces! I’m a fan!! I also decorate with blue in all my rooms, so I adore all your blue touches!???? Thank you so so much, Dawn. This really means so much to me. What a kind compliment. It’s been really fun to work on the space and see it come together. The room is beautiful! To me, it reads as a casual, grown-up space that isn’t afraid to have the kids hang out in there for family movie night. I love how you married the spaces together too with the breakfast nook! Courtney, this is absolutely a gorgeous room. Lauren said it perfectly. 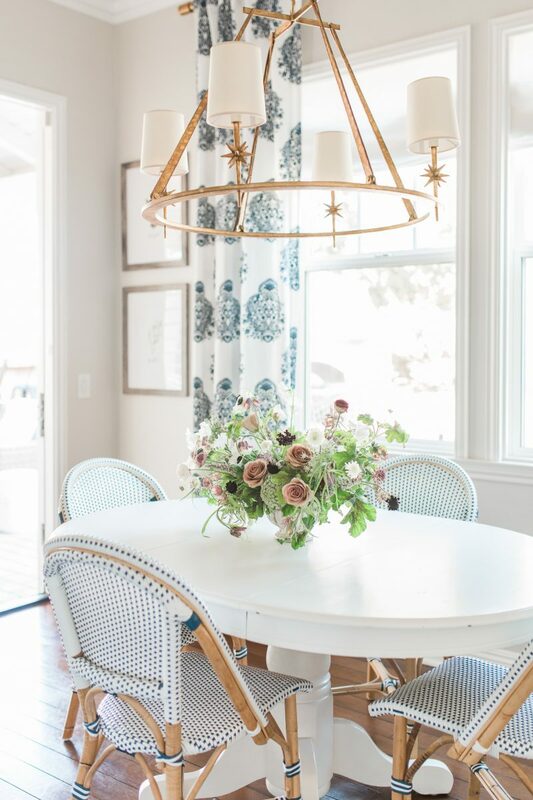 The rustic table is beautiful and I just love it with the blue velvet and the wicker. You have a beautiful style. The room is very welcoming and comfortable. That coffee table is a great size. Well, I could go on and on! Needs to be on a magazine cover!! Allison, you’re the best. Thank you. I appreciate this so much. It’s been so much fun to work on the room over time and we are thrilled with the table. You’ll have to stop in for a cup of tea sometime! Wouldn’t that be fun. Courtney, your home is so pretty! I love the mixed sofas and the leather pillows are calling my name. Your blog continues to be my favorite! (you and Megan in Houston. Such a lovely room! I really like how you used furniture and accessories from high and low price points to pull the whole thing together. 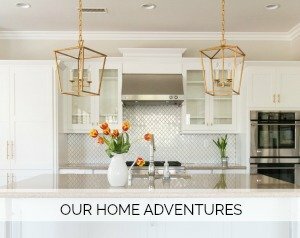 Taking your time and purchasing items that you truly love created a room that is comfortable and personalized for you and your precious family. 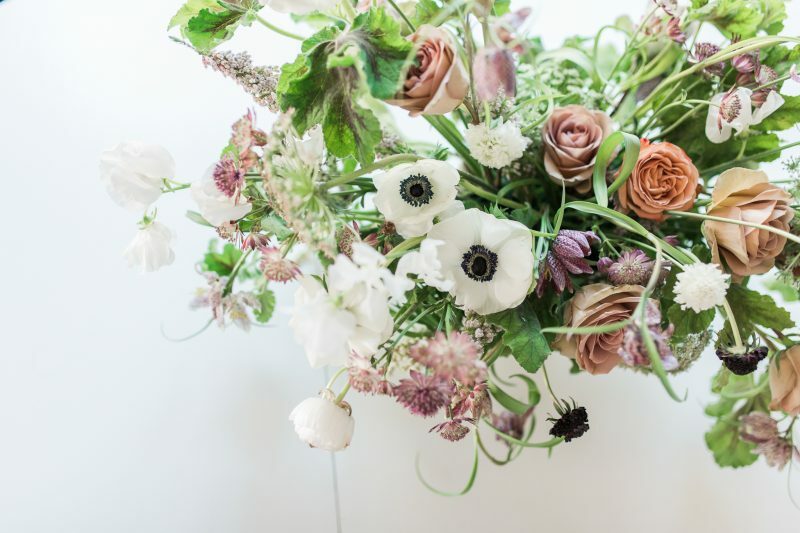 I adore your blog, thank you for all that you share with us ???? What a beautiful room! I’d expect nothing less from you, Courtney. I want those wicker chairs and I see that they are in stock at my Ikea. As I recall, your sofa from your old house was custom also. Maybe you could do a post on working with a custom sofa company including how to find a good one. I love how much light your home gets, it’s just gorgeous. So pretty! Where do you buy the fabric to make your curtains? You always amaze me with your ability to mix patterns. I love everything about this room Courtney. From the furniture to the curtains to the art. Every piece compliments each other. 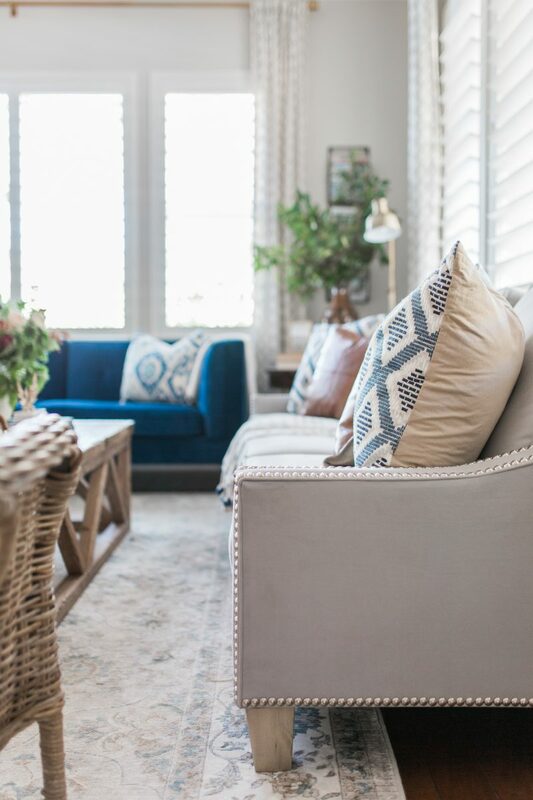 I love navy blue and I seriously love the way you used it in this room. Simply beautiful. I absolutely love it ALL! Gorgeous room – what is your paint color? This room is beautiful! 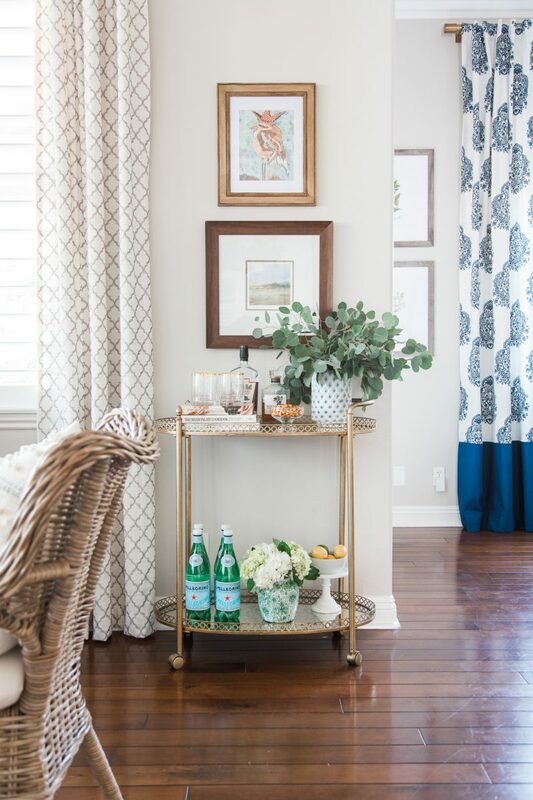 Do you have a source for the fabric you used for the drapes you made? 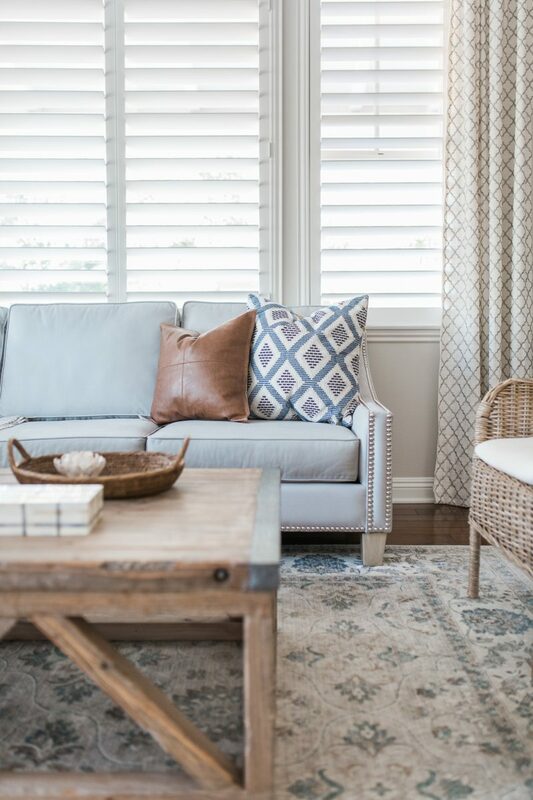 I love that there’s a pattern, but it’s still simple and neutral. 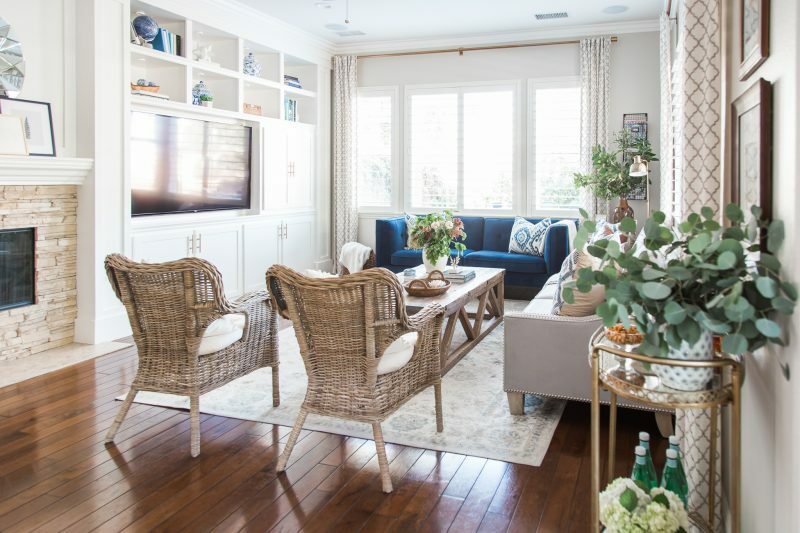 What a stunning family room! I love that you talk about taking your time to find the right pieces. We have been in our current home for almost 5 years, and I still feel like I am getting the lay of the land! That coffee table is sooooo amazing. 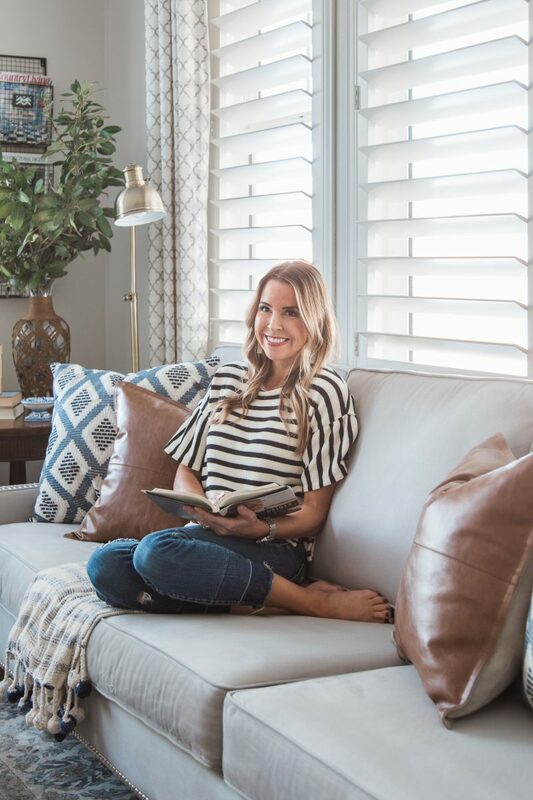 And I love that you paired it with those IKEA wicker chairs, they are one of my fave IKEA stand-by’s … I might have to incorporate them into my family room! 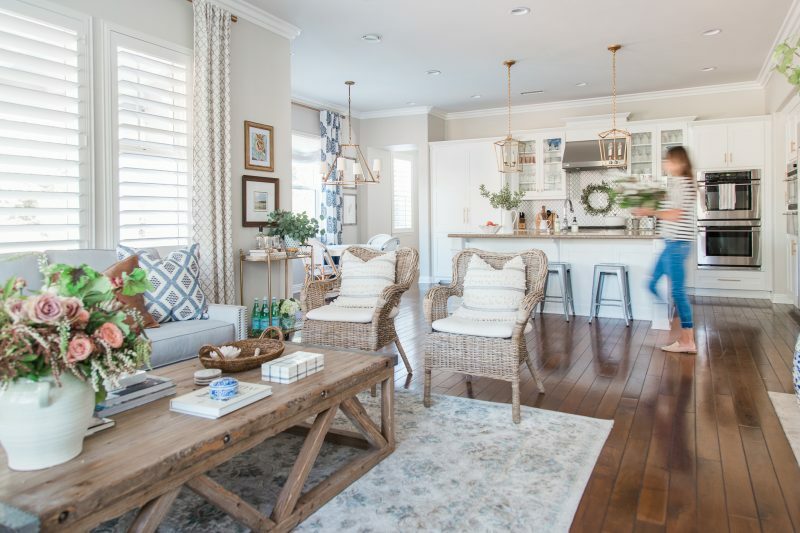 I love how you have incorporated all of these elements and tied together three different areas, that is not an easy thing to do in such a big open space! Well done you! Everything is beautiful Courtney!!!! I love every single piece in the space???? Your room is very pretty and so relaxing. I absolutely love your fireplace area ! 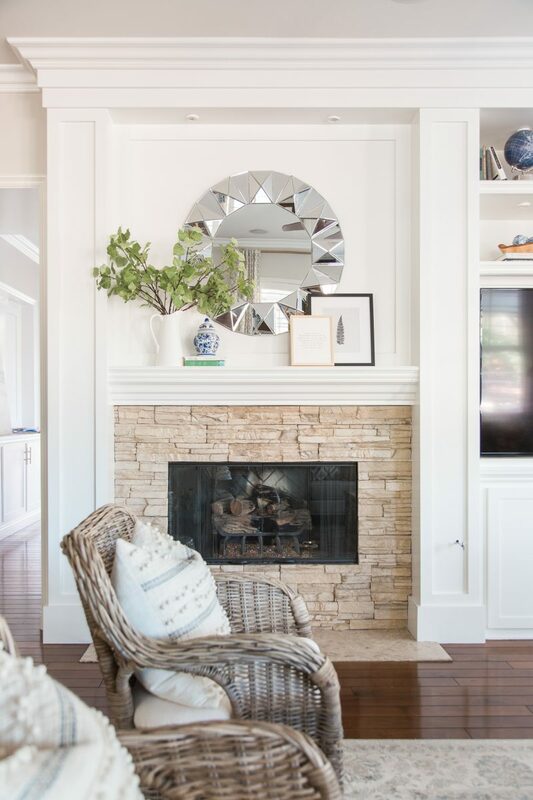 Is it a gas fireplace or an electric insert? The look and scale of the stacked stone is perfect. Enjoy! Such a lovely space! I’m also a big fan of velvet furniture, we have green velvet chairs in our great room. My Grandparents had a green velvet chair in their living room so I’ve always loved the look of velvet. Thanks for sharing! 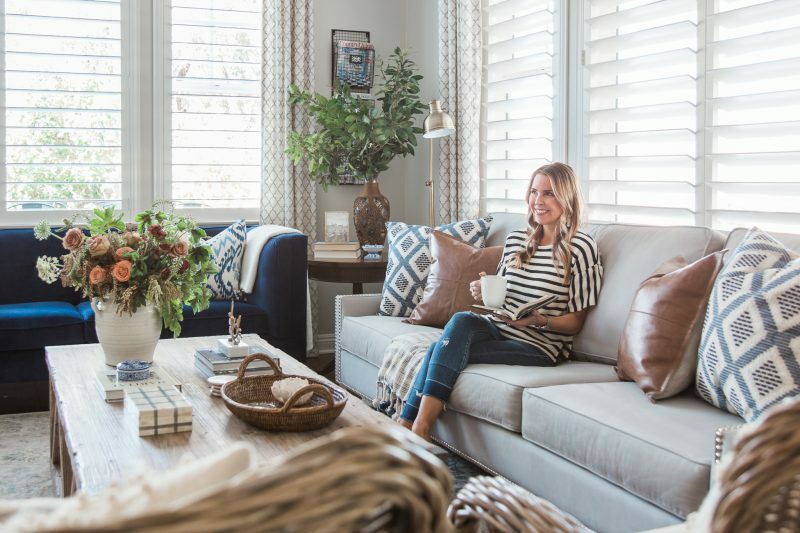 Courtney, I love what you did with this room! Your built ins and windows are beautiful to begin with but you made it so cozy, light and pretty!! I love the way you worked in the greenery. It brightens up the space in such a beautiful way. What I’m wondering though is how you got your pillows so firm and fluffy. This is probably common knowledge for everyone else, but I’m at a loss as to how to keep my pillows from looking sad and droopy. This is such a beautiful space! Well done! What is the paint color you used? It is perfect!